I’m really feeling the Facebook Page love tonight (126 likes!! woohoo! ), so instead of being a healthy Nutritionist, and heading to bed for my 8 hours of uninterrupted sleep, I’m going to stay up and share the Stuffed Mushrooms Appetizer that I made a couple of weekends ago. For the most part, I try to cook gluten and dairy free. I recognize that a lot of people get freaked out when I say dairy free (especially in combination with gluten free). In the words of a close girlfriend after I told her about a recipe I was trying out, “There are far too many “frees” in that sentence.” But, what people don’t always realize is that there are tons of other foods you can add back in to a recipe that have better nutritional content, as much flavour, and none of the ill-effects of dairy and gluten. For example, in this recipe, instead of adding cheese, I added sesame seeds, nutritional yeast, and a pinch of salt. Sesame Seeds are an amazing source of calcium and magnesium. Calcium and Magnesium are critical in bone health, and magnesium can also help with PMS symptoms, sleep and migraines, as it is a muscle relaxant! I also added Nutritional Yeast, which is a great source of Vitamin B12. B12 is really important in supporting your nervous system, and therefore your energy levels. When your body is under stress, the B Vitamins are depleted, and let’s face it – we all have stress in our life! Lastly, leeks are from the Allium family (same family as garlic and onions), which has sulfur containing nutrients that are very anti-inflammatory and anti-microbial. You’ve probably heard of people taking garlic pills to help get rid of bad bacteria and colds/flus, well leeks have this similar benefit. 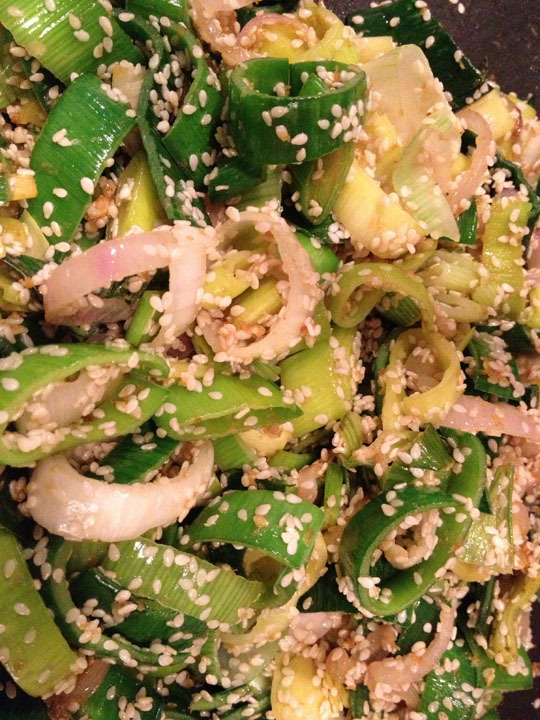 Leeks also have a high content of the B Vitamin folate. Enough about how healthy the ingredients are, here’s the recipe! Note: If you don’t have a food processor, not to worry! Just chop everything as small as you can so you can still stuff the mushrooms, and mix the stuffing ingredients in a bowl.